I did not watch the video, I could not bring myself to do that so if you do not want to watch the video please just send an email to the district attorney of Fulton County GA who will not investigate the cruelty being carried out on these poor animals. We need to shout as loud as we can to ensure this company is closed down, please take a minute to add your own personal comments at the front of the email. Thank You Guys. I’ve been meaning to write this for some time but it was only two weeks ago that I downloaded the photos from my phone. Back in March/April 2010, I took some photos at work around 7am as I noticed chemtrails in the sky and they showed something very interesting. Nothing unusual as we have all been seeing these over the past few years – parallel chemtrails. Despite a concerted effort by us all, Governments have denied that they exist and that they are in fact contrails. However, lets look at the next photos. In April 2010, I noticed another plane leaving a chemtrail at the same location – however, I noticed that despite the chemtrail, it was also leaving a contrail behind. This was taken at 8:04am. I took another photo 1 minute later – this was taken at 8:05am, check out the area highlighted by the red arrow – it shows the contrail disappearing, leaving the chemtrail in the sky. Do not believe our Governments when they tell us that chemtrails are in fact contrails – they are not, they are different as the photos above prove. Whoever it is, they have been spraying chemicals from the back of aircraft for many years and have been lying to us about their existence and why. We watched a documentary recently, cannot remember the name, and they showed how chemtrails have made it into advertising and TV, whether drama programmes or adverts (including animated) – no doubt to get us used to and not question the chemtrail existence. For more info, check out the other Chemtrails post on our blog and check out our Chembuster build post. I took this photo in September 2009 and didn’t look at the photo until recently. I was leaving work and noticed a chemtrail and to my amazement, I noticed a Sylph attacking it ! Now I work some 25 miles away from home and as I travelled home, this was in the sky all the time. Only when I got home did I realise that the Sylph was attacking the chemtrail over our house, no doubt encouraged to do so by our Chembuster. When I viewed this photo normal size, I could not make out the sylph but when I viewed it as a thumbnail, I could clearly see it – as kids, we saw the wind in this image – two eyes, a nose and his mouth open blowing the wind. Since that image has been around for maybe hundreds of years, our ancestors must have known and tried to share their knowledge about the elementals with us. Yes I know there will be some of you who say we will see faces in clouds or anything we look at but can you not see the face in this photo? In our opinion, Sylphs exist and are here to help. We posted when a change of government took place in the UK that there were no chemtrails since the conservatives and liberals took over…well it seems that, that was just a settling in period and we were hoping with the so called ‘recession’ that the government would not be able to continue with the spraying on two grounds, one a moral, the other financial …seems that this government along with the last one does not have a moral issue with spraying the people and on a financial level..they seem to have reserved enough coffers to pay for these planes to spray continually throughout the day and night everyday weather permitting!! !…Do you remember a clear sunny day? Please remind me, cos when you look at movies or tv programs or look up the chemtrails are everywhere…on tv and movies they are subliminally showing us that this is a normal sky when it is clearly not. We have only recently found out that the sun contributes to wind patterns and as the governments of the world are so not ending the spraying even in a recession you have to ask what are they doing this for?…are they in receipt of knowledge regarding the sun and solar winds that they are trying to shield the earth from, or is it population control, if its population control that means that they and their families are also breathing in this air…all we can say is there are changes that are clearly recorded in history about a time of change due in 2012 and we can also say more and more people are getting sick! The majority of the world is not aware this is happening. The Taiji cove is blocked off from the public. Cameras are not allowed inside and the media does not cover the story. It’s critical that we get the word out in Japan. Once the Japanese people know we believe they will demand change. Send a letter to President Obama, Vice President Biden and Japanese Ambassador to the United States Ichiro Fujisaki urging them to address this issue. Everyone who signs the letter will be able to have their name displayed in a widget that will be posted on top social networks, web sites and blogs in Japan. The widget will link to actions people there can take to make a difference.In The Cove, a team of activists and filmmakers infiltrate a heavily-guarded cove in Taiji, Japan. In this remote village they witness and document activities deliberately being hidden from the public: More than 20,000 dolphins and porpoises are being slaughtered each year and their meat, containing toxic levels of mercury, is being sold as food in Japan, often times labeled as whale meat. Send a letter to President Obama, Vice President Biden and Japanese Ambassador to the United States Ichiro Fujisaki urging them to address this issue. Everyone who signs the letter will be able to have their name displayed in a widget that will be posted on top social networks, web sites and blogs in Japan. The widget will link to actions people there can take to make a difference. you urge the Japanese government to revoke permits that allow Japan’s Fisheries Agency to continue this heinous, dangerous and illegal practice. I also urge American leadership to ensure that the International Whaling Commission includes the proper management of dolphins and porpoises and a comprehensive plan to stop the slaughter of dolphins in Japan. Your immediate action is needed. Go to the above link and sign the petition today, it only takes a few moments and we can stop this from happening. Believe it. Warning – Graphic scenes at the bottom of this page so if you don’t want to see what cruelty whale hunting entails please just follow the links for the petition. If you haven’t signed this petition please get involved ASAP. America, Norway, Japan and Iceland, Denmark, Germany will all be deciding on a vote to resume whaling, we cannot let this happen so we urge all of you to read below and sign the petition and any other petition that requires your voice to help animals, the sees and the earth. We must remember we are all one and we must all start to heal the Earth, great changes are coming and we have a choice, continue to destroy and kill and we will not survive on this planet because it will not and cannot sustain us, treat it with respect and love unconditionally all things and we can evolve into truly, loving souls and create a world of peace and harmony..You have to choose so please choose wisely. Such sadness…There is a time that is coming where we must choose, do we continue on the pathway of destruction and killing or do we choose to accept that we are all one consciousness and heal the wounds and care for our brothers and sisters like the whales. It only seems like a handful of people who are making these decisions on war and killing and there is 6.7 billion people on the planet. Our consciousness out numbers theirs and if we took just 1/2 hour each day to focus on peace and love within ourselves collectively we can change the world because together we are strong. Spread the word and the message. Killing whales for profit has been banned since 1986 — but that’s about to change unless we make a stand. The International Whaling Commission (IWC) just released a new plan that would overturn the global ban on commercial whaling, and even open a whale sanctuary near Antarctica for hunting. Japan, Norway and Iceland have continued to hunt whales in defiance of the worldwide commercial whaling ban. The proposed plan would make their hunts legal again. A decision on the plan to resume killing whales could come as soon as next month! On Thursday, a proposal will be unveiled that would legalize commercial whale hunting for the first time in 24 years. The fate of the proposal will be determined largely by the world’s immediate reactions to it — and according to insiders, many governments are planning to stand aside and allow commercial whaling to resume. An outcry is needed now to ensure they stand strong to save the whales. A strong international consensus has opposed whaling for decades — but for just as long, Japan, Norway, and Iceland have continued to hunt whales, ignoring the global ban on whaling or exploiting a loophole by claiming their expeditions were “scientific research.” Now they could be rewarded by a “compromise” proposal, in which their commercial whaling would be made legal. Today, whales still face many threats: not just the whalers’ harpoons, but also climate change, destruction of ecosystems by overfishing and pollution, and nets intended for other fish. A renewed wave of commercial whaling could devastate these extraordinarily intelligent and social cousins of humanity. This is no time to move backwards. As it is – there is no-one enforcing the ban in the Sanctuary apart from International Volunteers such as Sea Shepherd Conservation Society. I suggest you watch Animal Planets Whale Wars to see exactly how these volunteers are risking their lives to enforce the safety of the whales. It’s outrageous that the United States is wanting to be a part of legalising this awful industry. We need to stop this greedy action. 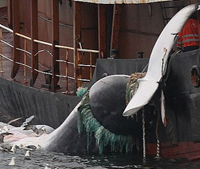 Take action here Obama, Say No to commericial whaling. Alongside the negotiations for a “compromise” within the negotiations about the Future of the International Whaling Commission (IWC) 40 environmental NGOs jointly presented a petition to all Latin governments Member of the IWC. They call for diplomatic actions to end scientific whaling in the Antarctica by the Japanese fleet. While among the Latin American countries some have in the past been sympathetic to support Japanese whaling activities, the region has teamed up as unified block since a few years and speak out jointly against the lethal use of whales. Jewish Voice for Peace are a group of people who are working together to bring peace to the Middle East to Jewish, Muslim and Arabic communities and are working with like minded people all over the world both Jewish and non Jewish. We are all brothers and sisters that deserve the right to live in harmony. Who are shouting loudly to the USA and Israeli governments to say no more killing, not in our name. Jewish Voice for Peace calls for a U.S. foreign policy that promotes democracy and human rights. The United States must stop supporting repressive policies in Israel and elsewhere. U.S. military aid to countries in the Middle East must be based on rigorous enforcement of the Arms Export Control and Foreign Assistance Acts, which mandate that military aid may be used for only defensive purposes within the recipient country’s borders, and that aid may not be delivered to countries that abuse human rights. I remember listening to my great aunt Tante Babe’s heartbreaking stories of seeing her young cousin killed during an attack on thousands of Jews, a pogrom, in her city of Bialystok. That infamous pogrom was in 1906, the very year the American Jewish Committee was founded to oppose such attacks. Feeling alone and unprotected, our family needed the American Jewish Committee. Years later, I remember my parents supporting the Anti-Defamation League because of their support for Jewish refuseniks in the USSR. And then there’s my grandfather who endured the extermination of most of his family at the hands of Nazis. He is why I greeted with enthusiasm the emergence of a human rights group in the 1970s named after Simon Wiesenthal, the famous Nazi hunter. These Jewish organizations came into existence at a time when my family – and so many others – needed them desperately, and their contributions and achievements on behalf of Jews and non-Jews made me proud. But times have changed, and the missions of these groups have changed. All too often, advocacy for universal human rights has taken a back seat to their belief that they must support the Israeli government unconditionally. For example, as I write this, it has been 22 days since Israeli citizen and human rights activist Ameer Makhoul was brutally taken from his home in the middle of the night, held without charges, denied a lawyer for 12 days, and most certainly tortured. All under cover of an Israeli media gag order. Regardless of the charges against him, which were only announced today, it is hard to imagine these groups remaining silent in the face of such outrageous repression in a modern democracy. Especially against an Israeli citizen. The pattern is not new. It is painful for me to say that today these organizations – organizations with such a proud history of civil and human rights – for many of us have come to stand for the exact opposite. Sadly, I now find myself opposed to the American Jewish Committee, the Anti-Defamation League, and the Simon Wiesenthal Center for dismissing criticism of Israel as anti-Semitic, for putting Israeli foreign policy above Armenian genocide recognition, for vilifying Muslims and Arabs, and for building a “Museum of Tolerance” on top of a Muslim cemetery in Jerusalem. For many people, these organizations have not been relevant for a long time. You might be one of them. But we also know they continue to be an important voice for many Jewish people. And we will always need Jews to be safe. That’s why we must ask them to change just as so many Jews in America have changed. My dad is one of those people who supported the Anti-Defamation League. But when I told him the role they played in silencing criticism when it comes to Israel, he literally tore in half a donation check he had planned to send. I’m not asking you to go that far. But whether you love them or hate them, we have to call on them to change. We don’t expect them to fall in line with everything you and I support, but we expect them to at least have a line when it comes to basic human rights and dignity. Please join me in asking the leaders of the American Jewish Committee, the Anti-Defamation League, and the Simon Wiesenthal Center to denounce the increasing government-sponsored violence in Israel and Palestine. As Jews and non-Jewish allies who believe in universal human rights, we all have a right to demand that they speak out. Because they have the ear of Israeli leaders, we believe their denunciation of anti-democratic measures can make a difference where Israelis and Palestinians are suffering the most. Just last week, Peter Beinart suggested in his significant piece in the New York Review of Books that the greatest danger to the Jewish community today is not from outside, but from inside. Beinart was referring to the increasing disconnect of Jewish leaders from Jewish people, especially young people, when it comes to Israel and Palestine. Their ongoing unconditional support of Israel’s actions, even when they violate the basic tenets of Judaism and democratic values, has become untenable. Silencing NGO’s who report on these outrages, using restrictive legislation in the Israeli Knesset. Banning internationals who are insufficiently supportive of Israel. And through all of this, Jewish leaders remain silent. It has been decades since the first Palestinian refugees were barred from returning to their homes. It’s time our community leaders reflected our values and did as much to combat oppression when it is practiced by Jews as when it practiced against us.